Attending a career fair is a great way to explore the wide range of organisations actively recruiting for placements and graduate positions. They will also allow you to practice your networking skills with employers in a relaxed informal environment. 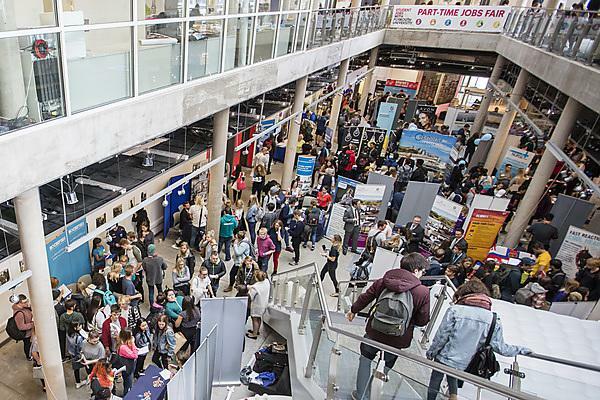 Each year our Placement & Graduate Career Fair welcomes businesses from a wide range of sectors, recruiting from a variety of courses including business, finance, marketing, tourism, hospitality, law, healthcare and teaching to name a few. Previous exhibitors include Aldi, BMW Group UK, Lidl, The Ritz Hotel, Highways England, PwC and Livewell South West. Our next Placement & Graduate Career Fair is taking place on Tuesday 30 October 2018. Attending a career fair is a great way to explore the wide range of organisations actively recruiting for placements and graduate positions. They will also allow you to practice your networking skills with employers in a relaxed informal environment. Each year our Science and Engineering Placement & Graduate Careers Fair welcomes a variety of businesses looking to recruit students interested in entering the STEM (Science, Technology, Engineering, and Mathematics) sector. Previous exhibitors include AECOM, AWE, Babcock, BT, Dartmoor Zoo, National Composites Centre, Royal Air Force, Software Cornwall and WSP. Our next Science and Engineering Placement & Graduate Career Fair is taking place on Wednesday 7 November 2018. Each year the Careers & Employability Service, in partnership with Student Jobs, showcase two recruitment events for students looking for part-time work whilst studying. In October, our Part-time Jobs Fair welcomes local employers to promote both on and off campus opportunities and in March we work in partnership with UPSU Volunteering to bring a host of voluntary, local and national employers onto campus for our Summer Opportunities Fair. Part-time work is a great way of not just earning some extra money but to also develop your communication skills, confidence and commercial awareness. Part-time work can be a really useful addition to your CV. The Careers & Employability Service, in consultation with the various faculties run a wide range of employer led careers information and recruitment events to help you to interact with employers as part of your career journey. See how careers fairs provide fantastic opportunities to network and develop yourself.